Tis the season to spend the big bucks, right? How can you save money during the holidays. After all, you can "minimize" your spending as well! I understand the desire for Christmas Lights. However, do you need them everywhere? And do you leave your lights on all night long? Put them on a timer or shut them off when you go to bed. 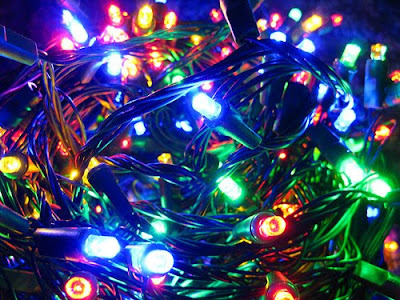 Keep your electric bill from going up during the holiday. Also, take the lights down after the holiday! No one needs new decorations each year. I know plenty of people that basically collect the stuff! We've actually gotten rid of all of our decorations (it wasn't a LOT anyway) except for a handful of sentimental ornaments, stockings for each of us, and hangers for the stockings. Do you have some additional space that needs decorating? Or perhaps you have a desire for new decorations. Craft them! Paper chains and strings of popcorn are fun! The retail industry wants you to think that $ = ♥. You do not have to spend a specific amount of money to show that you love someone a particular amount or more than someone else. That sort of competition honestly a little sick, in my opinion. Especially when debating gifts for children, think about the longevity of the item. I don't just mean the quality, but also the attention span it will pull. You could also avoid battery operated toys because they cost more money down the road. There are so many options out there that do not require electric or battery power. Another possible way to save money is add-on toys. If the child (or even an adult) has a set of some kind (building blocks, race tracks, etc. ), you can get additional cars, tracks, or blocks for the set. This will likely cost less that starting from scratch with a new toy. I've also seen this done with pearl necklaces for girls. A single pearl is added each year. Then, of course, there are homemade gifts! A box or tin full of homemade cookies or fudge are great! Plus, they don't take up space permanently. You could also make reusable shopping bags. There are a TON of possibilities when it comes to making gifts, even for kids. 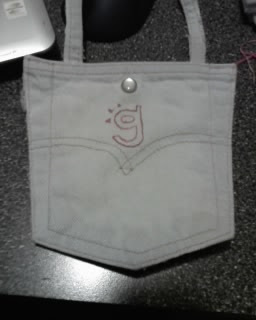 A couple of years ago, I used a bunch of old jeans pockets to make purses for the little girls on my list. I even embroidered their initials or a cute picture on them and added a snap closure! Using the pockets meant minimal actual sewing! How do you feel about practical gifts? I know most kids don't want to receive practical stuff, but some really do like it! I especially like practical gifts within our household. If your kids get store bought presents for Mom & Dad, consider using the opportunity for practical stuff. I feel like this doubles the bang for your buck. Hubby needs thermals for work, but it gets put off for other expenses... daughter can give them to him as a gift! 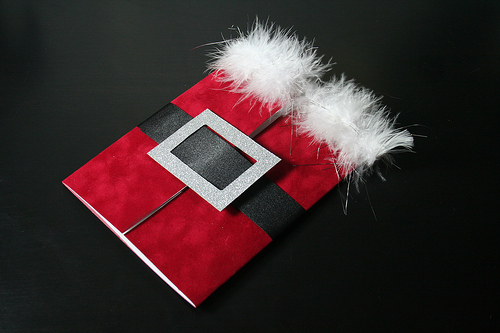 Now you've used gift budget, but fulfilled a gift expense and a regular upkeep expense! Regifting can be a dangerous option. I actually keep a spreadsheet of gifts I've given (and money I've spent) for Giftmas so I can make sure I don't get someone the same gift I've gotten them before. This also comes in handy for regifting. If you receive an item that just doesn't suit you, you can often return / exchange it. If you can't do that, you can totally save it for regifting! Just be careful that you don't give it back to the same person or household. How do you feel about used gifts? Some items are easier to get quality used items than others. Used books, for instance. You can even shop for them online and find out the condition before choosing to purchase. You could also go the used option with classic toys or vintage clothes. Yes, some toys are available in redesigned versions, but how much would your adult friend love to get an old, original Game of Life or Light Bright? Sometimes the oldness of an item is precisely the charm! and explanations of each gift wrap. My grandmother used to love to save everyone's wrapping paper and reuse it. It seemed silly while everyone was unwrapping their gifts, but I had to admit... I loved the way the sheer variety of paper looked under her tree! These days you can get really cheap gift wrap, but you really do get what you pay for. The cheap stuff often rips before you can get the gift to the recipient! Aluminum foil is an original idea that I love. You have options, too. You can leave it flat, you can crinkle it, you can use the shiny side or the dull. However, I really don't think it is cheaper than gift wrap. It also isn't less wasteful than any other option. It is handy for times when you just don't HAVE any wrapping paper. Sound boring? I've done brown paper, tied with string, and then used a stamp set to address it like shipping. You could also use stencils or shipping stickers/address labels. I think these make very attractive gifts. 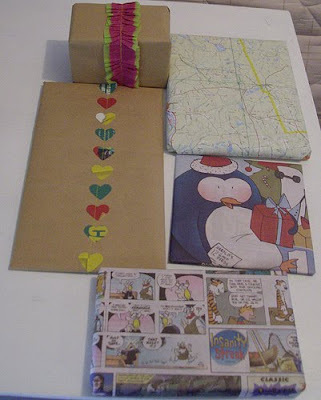 I have always loved the idea and the look of using the Sunday Comics (the one day the funnies are in color) as wrapping paper! This is a great way to reuse, if you already get the paper. I've long seen gift bags as the cop out of the gift giving practice. Gift bags are so much easier to "wrap," but they are nowhere near as fun to open! I have known a lot of people that save them and reuse them, though. I did but then gave them all away in a minimizing fit! That said, I have another gift bag option for you: Wrap Sacks! These are cloth bags you can buy that include individual codes. You can enter the code into the website to track your bag through re-gifting! Each person can enter the code and see where the bag originated and where it has gone. I think this is such a fun idea! Alternatively, you can make your own cloth gift bags as well. One year I made cloth pouches and gave nieces and nephews marbles in them. They made great little carry bags for the marbles. In this way, you can make the wrapping a part of the gift. You can use plain white paper or butcher paper to wrap your presents. Kids love to decorate presents like this! They (or you) can use stickers, markers, stencils, whatever! The great thing about butcher paper is you could also use water colors! I made some gorgeous presents that way, but I found I had to re-wrap with wax paper over them because they came out sticky. The added wax paper made for a gorgeous finish! This option is cheap, but not the greenest option if you have to wrap twice. This is another place where paper gets wasted. What creative alternatives could you use? I love the idea of attaching a mini-gift as part of or a replacement for the gift tag. Perhaps you have one relative that collects... Bugs Bunny. Attach a Bugs Bunny key chain as the gift tag. You know who it is for (though perhaps others won't pick up on the idea right away). You can always claim to be the gift giver rather than having to write your name on a tag. You could also make Shrinky Dink key chains, zipper pulls, etc. that double as gift tags. Some of the gift wrap options I mentioned above lend themselves to writing the gift tag directly on the package. Foil, brown paper, butcher paper, etc. all offer this option. Click image for Photo Credit and Tutorial Details. There are plenty of options here. You can have special cards printed, which is much cheaper if you go with a site like Vista Print. You could also make or have your kids make cards, though! You could do a family newsletter instead of buying cards. Better yet, a family newsletter could not only become an annual tradition, you could offer it digitally (instead of on paper + mailing costs) to those with the capability. Personally, I just don't do cards... for any holiday. If I approach the greeting card section in a store, I get sucked into it. I can't stop reading them until I've spent all day there! How do you make it through the holiday without breaking the bank? And don't forget that you can recycle paper giftwrap! So many good points! 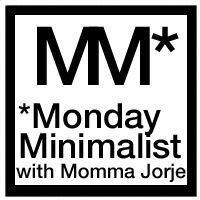 Not only are these tips great for minimalism, but they're also very eco-friendly. Also, we love Vistaprint - not just because my hubby works there ;-) - but also because we consistently get high quality products for the lowest prices around. You can also choose cards from Vistaprint that use only recycled paper, which I like. Love this list! We bought our boys' gifts at Goodwill Outlet this year — they're young enough that they won't at all be offended. :) I do think giving a vintage game to an adult friend would be awesome. I love your regifting spreadsheet — I usually just keep a list each year, but yours sounds so much more impressive. To minimize our wrapping paper collection, we started using plain white tissue paper (super cheap, easy to find) and then really pretty ribbons, often cloth ones that can be reused (particularly if the recipient opens the gift at our house and leaves the ribbon, heh). However, Sam just found hordes of Christmas wrapping paper at Goodwill Outlet and brought home a couple rolls. I'm ok with that since we're using it up as quickly as he brings it home (storage was a problem with our old giftwrap collection), and it isn't wasteful because it was going to be thrown away anyhow. These are great ideas, Jorje! This year we're gifting all hand made/local items, and fewer gifts over all, too. I like the guideline I read somewhere last year to limit gifts to 4 things: something they want, something they need, something to wear, and something to read (obviously not for everyone on your list, but for those you might be tempted to go overboard for). I will be wrapping gifts in leftover paper from previous years, reusable shopping bags, and ribbons salvaged from other holidays, with the gift showing (since Daniel won't know the difference anyway! ).